From right, Wall Street Theater President Suzanne Cahill, Wall Street Theater Artistic Director Billy Blanks, Jr., Mayor Harry Rilling and State Senate Majority Leader Bob Duff (D-25)reenact the Wall Street Theater marquee lighting Friday on Wall Street. NORWALK, Conn. – The Wall Street Theater celebrated a milestone Friday with a ceremonial lighting of its marquee sign. The first-time lighting signified the completion of the theater’s construction, developer Frank Farricker said. 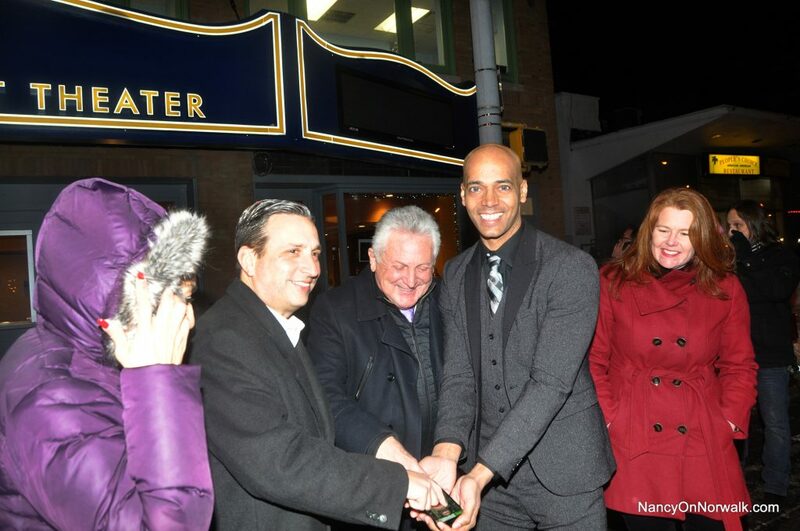 About 40 people crowded into the theater’s lobby for the cocktail reception, held in connection with Downtown Norwalk First Friday, after Mayor Harry Rilling, State Senate Majority Leader Bob Duff (D-25), Wall Street Theater Artistic Director Billy Blanks, Jr., Wall Street Theater President Suzanne Cahill and Farricker braved the frigid temperatures to turn on the sign. The theater was originally opened in 1915 and is a National Historic Landmark, having been called, at various times, The Regent, The Norwalk Theater, The Globe Theater and The Roxy. Its renovation was partially funded by a $1.5 million state grant; Connecticut Light & Power bought the Wall Street Theater’s state historic tax credits in exchange for $1.81 million. The theater opened in April. “It’s such a beautiful building. I am glad they saved it,” said a woman who identified herself as a lifelong Norwalker, and said her name was Lisa. “This is truly one of the things that is going to bring Wall Street back. This is an anchor,” Duff said. “This is an amazing thing that is really going to bring wall Street back,” Rilling said. Farricker said that was only for Friday evening and the sign would remain fixed for a period of time. A great addition to the Wall St area. wonder how Norwalk’s first automated parking garage with more than 200 spaces is doing.